Palace Grill is a ragin’cajun restaurant off of State Street in Santa Barbara that is always there when you’re ready for a good time. The list of things that excites me about this restaurant is almost never ending but let’s just start from the beginning. As you walk up to the restaurant you’ll hear musicians entertaining the diners waiting outside for a table and you’ll see Errol (the general manager) glad handing and treating the hungry diners to some cajun crawfish popcorn. (Delish!) As you walk into the restaurant your senses will be filled with enticing smells from the jambalaya, gumbo and étouffée cooking in the back. As you find your seat you’ll be greated by the friendliest waiters you’ve ever met and will receive a basket of muffins boasting such flavors as “black strap molasses” and “apricot and honey.” You’ll be fencing with your forks to secure your favorite until you realize that this is just the beginning and they’ll bring you as many muffins as you want anyway. My favorite dish is the crawfish ettoufee which has a rich sauce filled with cajun spices and poured over rice with a side of steamed veggies. The delectable crawfish coupled with the trinity of New Orleans (onions, bell pepper and celery) give such a powerful flavor combination I just keep coming back for more. Despite my stomach being filled to the brim there’s always room for a warm chocolate soufflé, right? Or if its lunch time its almost impossible not to order their beignets. And just as you are about to finish the music swells and the waiters come around to all the tables toasting to Louie Armstrongs, “Its a Wonderful World.” And guess what? It truly is. Walking up to Float off of State Street in Santa Barbara you get the feeling that this location is an island unto itself. Surrounded by, well…nothing, this structure is still standing after what must been years of the former neighborhood being converted to large structures and space for parking. As I walk in I’m greeted by friendly staff and a modern clean interior design. After changing into a robe, I’m escorted upstairs to the waiting area. With a large vaulted ceiling adorned with a beautiful glass ball chandelier and a roaring fire I can tell I’m going to quite comfortable. I get some magazines, hot tea and trail mix and get busy relaxing. I’m then introduced to my masseuse and we walk back downstairs (this time through the garden) and into the massage room. There is beautiful natural light streaming in and some lovely relaxing music playing. As we get started I can tell that not only am I going to be getting a relaxing massage but a much needed one. Float offers their Float Signature Massage that includes some deep tissue as well as swedish elements. Evidently my neck and lower cranium needed a bunch of work (probably due to my hours of staring my computer screen) and after the massage was over I felt like I was still, well…floating. Thanks to strong hands and a soothing environment, I would recommend Float to anyone. 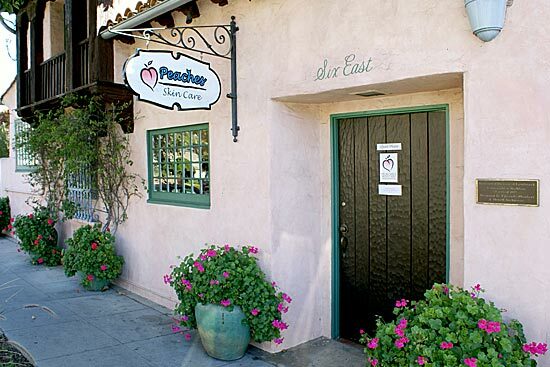 Paradise Cafe has been a local staple in Santa Barbara since the 80’s and its signature burger is still going strong. Cooked over an oak grill this mouthwatering delight packs in the flavor with its layered perfection. First start off with a fluffy onion bun slathered in thousand island dressing. Then add red onion (grilled on the oak grill! ), melted cheddar cheese, tomato, lettuce and of course the premium beef burger and you’ve enter burger heaven. With a side of crispy fries or a side salad (or both!) you have one well rounded meal. Not full yet? Grab a slice of their espresso chocolate mousse pie and I guarantee it won’t disappoint. Peaches Skin Care win’s my vote for best facials in Santa Barbara. Peaches is no ordinary skin care establishment. Its THE final word on skin care and is making it a point to show results for their clients through organic and natural means. At Peaches they believe that the body already has all the potential for healing already built inside of us. We just need a little boost to get on the right track for long lasting beautiful skin. Peaches advises on working on the skin over time through purchasing a series of facials that are highly reduced in price so that achieving the ultimate complexion is affordable. After my first appointment I was throwing away my liquid makeup and replacing it with mineral powder that doesn’t clog the pores or cause wrinkles. Over the course of my facial series I was slowly given new cleansers, masks and and moisturizers that would aid in getting rid of old skin cells building up over time to show the new skin underneath. Peaches carries their own line of specially formulated products that are not only organic but don’t have any preservatives either. This means that you can’t keep them on your shelves for years which is a GOOD thing. Its sort of like putting foods full of preservatives in your body (think donuts, chips or anything you can find at a gas station) which aren’t good for you and neither are the face cleansers that last forever. So with all these tools at their disposal, Peaches is delivering what humans have been searching for since the dawn of time. The fountain of youth.